The reportedly Pastor Adeboye Prayers’ social media account comment about heaven and punishment of sinners using the dehumanising picture of IPOB members being brutalised and dehumanised by soldiers during the onset of the controversial Operation Python Dance II in Abia state, has caused uproar. In the comment sent out by the Prayers’ account of the General Overseer of RCCG, it said, using the IPOB picture that caused international uproar and condemnation, ‘this is how soldiers of heaven will arrest and punish all your enemies in Jesus Name’. It then requested social media users or commenters to type amen to the prayer. This has created such condemnation and some has called it several terrible names and it is yet to be refuted by the general overseer of RCCG, Pastor Enoch Adeboye. Some commenters have disapproved this account as his own but some fake account created by mischievous element. While this has not been officially refuted and condemned, many folks on social media have called such act very cold and nauseating. Also, it could be recalled that during this controversial operation python dance II, the GO of RCCG as well as many other General Overseers except those from South East never condemned the actions or deaths caused by the activities of the Nigerian soldiers in Abia. At the time of this report, no official statement has been put forward by RCCG to condemn or refute or accept the ownership of the social media account, which wrote this. The Christian Association of Nigeria (CAN), yesterday, night, brushed aside the Federal Government’s suspension of the new corporate governance code of the Federal Reporting Council of Nigeria (FRCN) for Not-For-Profit-Organisations (NFPO). In Part B of the NFPO’s code, published on the FRCN website, financialreportingcouncil.gov.ng, the federal agency listed them to include homeless shelters, hospitals, clinics, rights groups, para-military (scout, brigade, etc), philanthropic organisations, schools, temples, church, mosques, synagogue, seninary/Bible college, any other religious body, mission or society, among money others. General overseers, founders and leaders of religious organisations, including churches and mosques, who have been in the saddle up to 20 years or more, or who have attained of 70 years of age are affected by the now suspended FRC code. Perhaps, in fulfilment of the law, Pastor Enoch Adeboye stepped down last week as general overseer of the Redeemed Christian Church of God (RCCG) in Nigeria. In his stead, he appointed Pastor Joseph Olayemi as the church’s national overseer in Nigeria. Regardless, CAN President, Mr. Supo Ayokunle, who spoke through his spokesperson, Mr Bayo Oladeji, yesterday, said the association will study the new law and react appropriately. “We are aware that FRCN’s exeucitve secretary, Jim Obazee has been sacked and that, the new corporate governance code has been suspended. Ayokunle, a reverend, took over CAN leadership from Pastor Ayo Oritsejafor. The election was conducted at the National Ecumenical Center, Abuja in June 2016. Oladeji also added that CAN leadership would likely meet on the matter next week since Ayokunle is presently out of the country. Regardless, Bishop Samuel1 Olumakinde Alawode, presiding bishop of Maranatha Lord Cometh Ministries International, with headquarters in Ibadan, Oyo State, insisted government cannot regulate succession in churches. “CAN has its succession procedure enshrined in its constitution and some of these churches have existed for centuries, before the birth of Nigeria in 1914! These churches have procedures for running their organisations. Retired Bishop of Akure Diocese of the Church of Nigeria, Anglican Communion, Emmanuel Bolanle Gbonigi also said it was wrong for government to attempt to regulate how churches are administrated in Nigeria, just as the President of Mount Zion Faith Ministries International , Evangelist Mike Bamiloye said there is no cause for alarm. Gbonigi told Daily Sun, yesterday, that he was not aware of the law as he only heard of it on radio last Sunday, after the appointment of a National Overseer by Pastor Enoch Adeboye, of the Redeemed Christian Church of God (RCCG). The RCCG national overseer will administer the church in Nigeria. Gbonigi, who retired as bishop of Akure Diocese, after serving for over 43 years, said he retired in accordance with Anglican regulation that a bishop should retired after the age of 70. “It is not right for government to be involved in how a religious organisation is administered. Religion is personal and the fundamental right of every individual. Government cannot dictate how they must be administered. Also speaking, Bamiloye said he won’t comment until he fully understands the new governance code “because I don’t how church, mosques, charity organisation and orphanage homes will be grouped together. On its website, financialreportingcouncil.gov.ng, FRCN explained why the new governance code became necessary in a its 29-page rules set for Not-For-Profit-Organisations (NFPO). “Many NFPOs operate with unknown frameworks, with governments completely in the dark as to both their ownership and principal accountability. In the context of current global insurgency, the operations and funding of NFPOs raise serious security concerns, hence the need for good governance of NFPOs in the country. Many Nigerians particularly members of the Redeemed Christian Church of God are still trying hard to sink in the fact that Pastor Enoch Adeboye has stepped down as the General Overseer of the church. The announcement of Pastor Joseph Obayemi as the new General Overseer of the church in Nigeria further accentuated the shock and disbelief that greeted Adeboye’s announcement. However, the fact remains that Pastor Obayemi is relatively unknown to most members of the church in Nigeria. Pastor Joseph Obayemi was the pastor in charge of Province 28, region 2 in Lagos State. For a long while now, he has been a prominent minister of the Redeemed Christian Church of God and also one of the decision makers. He is also a member of the Governing Council of RCCG. Before his appointment as the new General Overseer, Nigeria, he was an Assistant General Overseer in charge of the Finance of the Church. He also headed the Board of Governors, House Fellowship of RCCG body. There are speculations that his appointment was based on the fact he was a special assistant to Daddy G.O on Finance PICR in the region where he was a pastor. He is also believed to be a confidant of Pastor Adeboye and had on many occasions represented Daddy G.O. at programmes. The Redeemed Christian Church of God (RCCG) says Pastor Enoch Adejare Adeboye remains its General Overseer, Worldwide. A statement signed by Leke Adeboye, the clergyman’s last son and Personal Assistant, said the clarification was coming on the heels of misrepresentation of Pastor E. A Adeboye’s announcement at the Annual Ministers Thanksgiving held at the redemption camp today that the Church Nigeria is now to be led by Pastor Joseph Obayemi. Adebayo said the clarification was sequel to the new legal requirements of the Financial Regulations Council, guiding all registered churches, mosques, and Civil Society Organisations. The regulation stipulates that heads of non profit organisations like churches now have a maximum period of 20 years to lead their organisations while in retirement and are not permitted to hand over to their families. 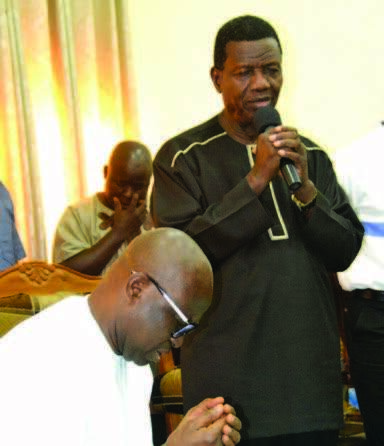 The General Overseer of the Redeemed Christian Church of God, Pastor Enoch Adeboye, has prayed for Ekiti State Governor, Ayo Fayose, to succeed in standing up for the masses. According to a statement issued on Saturday by Fayose’s Chief Press Secretary, Idowu Adelusi, the cleric said the prayer during a visit to the state as part of his nationwide tour for the RCCG’s annual ‘Let’s go a-fishing’ programme. Adeboye, who was received by Fayose and the Ewi of Ado, Oba Rufus Adejugbe, was quoted in the statement saying, “We thank God for your life. We thank God for your courage and for your boldness. We thank God for your being willing to take risks so that your people can be protected. The RCCG leader also prayed for other state governors. “We wish all other governors who stand for their people, defend their people, and know when to say enough is enough, success. We thank God for their life,” he said. Fayose in the statement, said he was sure all Ekiti people were blessed by Adeboye’s visit. “I know what it means for you to go around (the country). We pray that the almighty will continue to be with you as you traverse the length and breadth of the world spreading the gospel of our Lord Jesus Christ. We have longed and waited for your coming. We appreciate your coming because we know what it means. “You have been an inspiration to many people. We need prayers that the Lord will make 2017 a meaningful year. We believe in God; we believe in you. The Bible says if we believe in the prophet, we’ll have the benefits of the prophet and the benefits of God,” the governor stated. Adeboye, whose grandmother hailed from Ado Ekiti, told the Ekiti monarch that he could not resist his invitation to call at his palace even though his schedules were tight.